There are two great sites that we feel offer great ways to keep in touch with family and friends and let them know what they can do to help. CaringBridge offers free personalized websites that allow people to stay in touch with family and friends facing a serious medical condition, treatment and recovery. 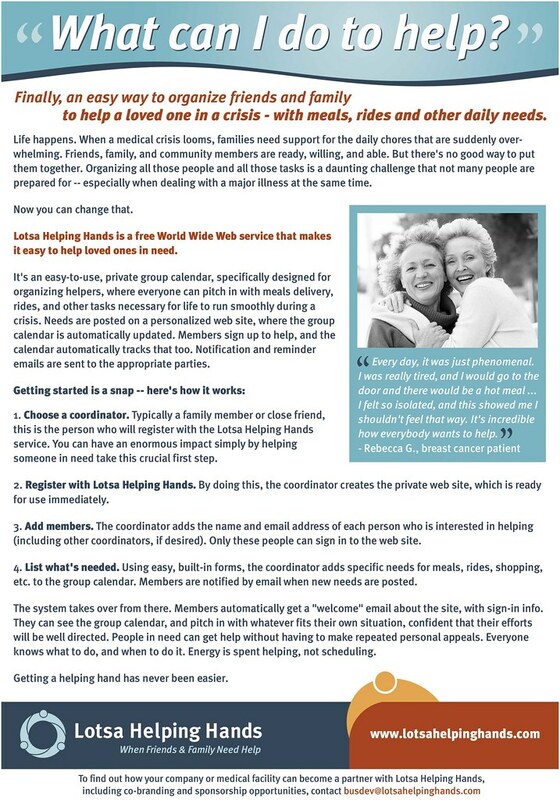 The goal of the service is to ease the burden of keeping friends and family updated, while also providing a way for them to send their love, support and encouragement. It is the first, largest and most widely used service of its kind. With a few keystrokes, CaringBridge authors quickly and easily create private and personalized websites that display personal journal entries and photographs. Family and friends visit the site to read updates and leave messages of support in the Guestbook. The CaringBridge experience is unique for both authors and visitors in its immediacy, intimacy and wide-reaching impact, connecting patients and families regardless of area codes and time zones. This technology has been a lifeline for people in more than 190 countries. Founded in 1997, CaringBirdgeâ€™s mission is to bring together a global community of care powered by the love of family and friends in an easy, accessible and private way. More than 20 million people are part of a CaringBridge experience each year and more than half a billion visits have been made to a CaringBridge website. For more information please visit www.caringbridge.org. Itâ€™s easy! From any computer with an Internet connection, a patient, family member or trusted friend simply goes to www.caringbridge.org and clicks on "Start Here" to create a CaringBridge website. By following a few simple steps, a personalized website complete with privacy options can be created in just two minutes. Immediately after a new site is created, CaringBridge sends the author a confirmation message, and even provides a sample announcement e-mail - including the site name and password - that the author can forward to friends and family. Once friends and family receive this announcement they can read updates in the Journal, look at new photos, and explore links to additional information. Most importantly, friends and family can leave messages of love, hope, prayers and support in the Guestbook - messages that often become a lifeline for families whose world has turned upside down. Visitors to the site can choose to receive e-mail notifications each time a new Journal entry is posted so they can immediately read the latest news about their loved one. This complete circle of communication brings together the close community of support that is so critical to a healing journey. Access to a CaringBridge site always requires that visitors know the exact name of the site they're trying to reach. In addition, CaringBridge site authors have the ability to add password protection, create a 'by invitation only' list to allow access to pre-approved visitors, or block access to specific unwanted visitors. CaringBridge authors have complete control of the privacy settings and can modify them as frequently as needed. Visit www.caringbridge.org today to setup your free site and to find out more about all the services CaringBridge provide.